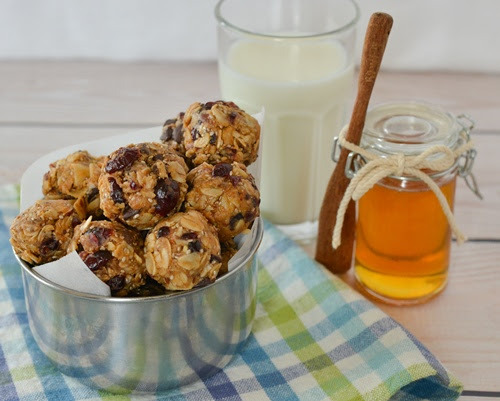 A list of lovely members recipes including honey. Prepare Coconut-Pecan Topping: In medium bowl, combine pecans, coconut, flour, brown sugar, and cinnamon. With pastry blender or 2 knives used scissors-fashion, cut in butter until mixture resem­bles coarse crumbs with a few pea-size chunks remaining. Prepare Banana Cake: Preheat oven to 350 degrees F. Grease 9-inch springform pan; line bottom with parchment paper and grease parchment. On sheet of waxed paper, mix flour, baking powder, baking soda, salt, and cinnamon until well blended. In large bowl, with mixer on medium speed, beat butter, sugar, and honey until light and creamy, about 5 minutes, scraping bowl occasionally. Gradually add eggs, beating after each addition. On low speed, add half of flour mixture, then mashed bananas, and vanilla. Add remaining flour mixture and beat just until smooth. 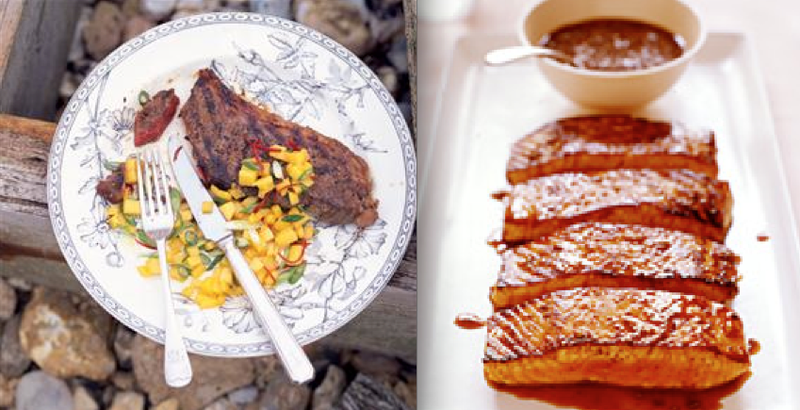 The fresh, juicy mango salsa, with a hint of chilli, perfectly complements the succulent barbecued steak. 1. Mix the honey, soy sauce and five-spice powder in a shallow dish with plenty of freshly ground black pepper. Add the steaks and massage the mixture well into both sides. Cover and set aside for 30 minutes. 2. If using a charcoal barbecue, light it about 30 minutes before you want to cook. 3. Season the steaks all over with a little salt. Brush the cooking grate with oil, add the steaks and barbecue directly over a high heat for 3 minutes each side for rare; 4-5 minutes for medium; or 6-7 minutes for well-done. Set aside, covered with foil, to rest for 5 minutes. 4. Meanwhile, mix the salsa ingredients together with a pinch of salt and serve with the steaks. This recipe almost has a Chinese sweet-sour feel to it. Feel free to adjust the amount of lemon juice to taste and even try it with lime juice – I would definitely recommend it for a summer’s day. Toast the coriander seeds in a dry, large nonstick frying pan over medium-high heat, stirring constantly, until golden, about 3 minutes. Remove from heat; let cool. Grind seeds in a spice grinder or crush with a mortar and pestle until coarsely ground. Make glaze: Stir together crushed coriander seeds, honey, soy sauce, and lemon juice in a small bowl until combined. Lightly brush the top of each salmon fillet with glaze; reserve remainder. Heat oil in the non stick skillet over medium heat until hot but not smoking. Cook salmon fillets, glazed sides down, 1 minute; reduce heat to medium-low, and cook 2 minutes more. Turn fillets over, and cook 3 minutes for medium-rare (salmon will be slightly pink in the middle), or longer if desired. Transfer to a plate; loosely cover with foil to keep warm. Pour remaining glaze into pan and bring to a boil over medium heat. Cook until glaze has thickened to the consistency of syrup, about 1 minute. Serve salmon with glaze on the side. NB can also easily be cooked on a barbeque. Pour the hot cream mixture over the eggs, whisking constantly. Return the whole lot to the pan and set over a low heat, stirring constantly, until the custard thickens enough to coat the back of a wooden spoon. Strain into a clean bowl and add the warmed honey and mix thoroughly. Cool and then chill for at least 2 hours before churning in an ice-cream machine following the manufacturer’s instructions. To make the honeycomb, tip the caster sugar into a saucepan and add the honey and 4-5 tbsp water. Bring slowly to the boil to dissolve the sugar. Continue to boil steadily until the caramel becomes honey coloured. Add bicarbonate of soda and, working very quickly, swirl the pan to mix evenly. Immediately pour into a greased baking tin set on a heatproof surface and leave until the honeycomb is completely cold and brittle. Break the honeycomb into pieces and gently mix through the ice-cream mixture. Tip into a freezer-proof container and freeze until needed. Serve the ice cream in generous scoops in cones or bowls. Try something different for dessert. This crisp pastry recipe with a sweet, nutty filling makes a delicious after dinner treat. To make the pastry: Put the flour, salt, sugar and butter in a food processor and whizz to breadcrumb stage. With the motor running, add the egg yolk with 2tbsp cold water and whizz again until the mixture starts to come together. Knead lightly until just combined, wrap in cling film. Chill for 20 mins. Set the oven to gas mark 5 or 190°C. Heat up a baking sheet. Line pastry case with Bakewell paper. Add baking beans. Bake for 15 mins. Take out paper and beans and cook for 8 mins more. To make the filling: Chop nuts roughly. Whisk the butter, flour, honey and sugar. Mix in eggs, a little at a time. Add sherry and all but a handful of the nuts. The mixture curdles, but don’t worry. Spread evenly over pastry case, then sprinkle with remaining nuts. Bake for 20-25 mins or until almost set in the middle. Cool for 15 mins, then take out of tin. Slice and serve with extra honey in a jug and some creme fraiche.